Owasco Lake is one of the Finger Lakes, a group of 11 long, narrow, roughly north–south lakes in an area called the Finger Lakes region in Central New York, in the United States. 30 miles from Syracuse, 66 miles from Rochester and 3 miles South of Auburn, Owasco Lake is a popular destination. Owasco Lake’s name may have been derived from the Iroquois word dwas-co, meaning bridge on the water. The name may also have been derived from the word was-co, meaning floating bridge. ▪ The Owasco Lake watershed is made up of parts of three counties, fifteen towns, and two villages. The watershed has a rich history of agriculture and was the childhood home of Millard Fillmore, the 13th president of the United States and John D. Rockefeller, industrialist and philanthropist. ▪ Over half of the watershed is covered by agricultural lands which consist mostly of hay, corn, wheat, and soy beans. With dozens of dairy farms as well, the farming industry is thriving throughout the watershed. Several education and outreach programs are working hard to ensure that watershed-friendly farming practices are used. ▪ Owasco Lake is 11.1 miles long, with a maximum width of 1.3 miles. The lake reaches a maximum depth of 177 feet and has a surface elevation of 712 feet above sea level, controlled by a dam on the lake’s outlet. The lake has a volume of 212 billion US gallons, and drains a watershed of 208 square miles. The lake has a refresh rate of just over 4 years. ▪ The city of Auburn is located at the northern end and takes its drinking water from the lake. The lake lies entirely within the boundaries of Cayuga County. Located at the south end of the lake is the hamlet of Cascade, which consists of a community of cottages, a marina, and a restaurant. ▪ Owasco has a relatively large catchment area, compared to its overall volume. Unlike many of the other Finger Lakes, it is almost completely surrounded by agricultural land so the lake is especially vulnerable to high levels of nitrogen from farm run-off. It is also downstream from the villages of Moravia and Groton. This has created a marked increase in milfoil and other lake weed growth and affected oxygen levels in the lake. Sewage treatment effluent from two communities flows into the lake, which is not monitored with such stringent controls as neighboring Skaneateles Lake, which has the purest water of all the Finger Lakes. ▪ Owasco Lake is an excellent recreation spot. Because it is smaller and shallower than many other Finger Lakes, its waters warm up much more quickly, so swimming, water-skiing, and boating are popular. At the lake’s northern end is Emerson Park, a county park featuring a beach and boat launch. 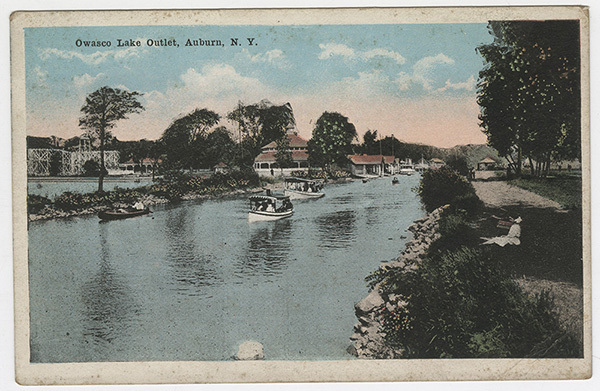 The lake’s northeastern corner is home to the private Owasco Yacht Club, founded in 1889. ▪ Fish species present in the lake include lake trout, brown trout, rainbow trout, landlocked salmon, smallmouth bass, northern pike, yellow perch, bluegill, pumpkinseed sunfish, rock bass, black bullhead, pickerel, and walleye. There is access via county owned hard surface boat launch in the park on the north shore for a fee.